Pictured L-R:[Top] California Strategies Principal, Steve Cahn; Senior Advisor on Early Childhood to Governor Newsom, Giannina Perez; L.A. Partnership for Early Childhood Investments Parker Blackman; Vice President of Policy and Strategy Kim Pattillo Brownson; Executive Director of Early Learning Lab, Catherine Atkin; California Strategies Senior Associate, Monique Ramos. 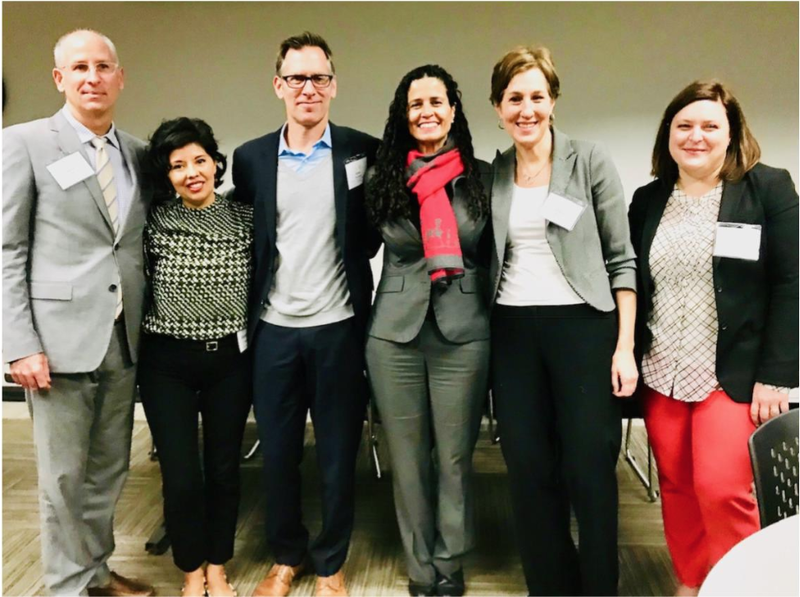 New Day for Kids: First 5 LA Vice President of Policy and Strategy Kim Pattillo Brownson served as a panelist for an event on Jan. 16 co-hosted by Southern California Grantmakers and the LA Partnership for Early Childhood Investment to explore what Gov. Gavin Newsom's administration will mean for young children and their families. Lead speaker for the event, held at the Los Angeles Area Chamber of Commerce in downtown, was Giannina Pérez, the newly appointed Senior Policy Advisor for Early Childhood in the Office of the Governor. Pérez is an early childhood policy expert and strategist with more than 17 years of experience in state policy, advocacy, and government. Members from First 5 LA’s Strategic Partnerships Department also attended the event. Pictured L-R: Community Relations Officer Bill Gould; Field Representative to Councilmember Victor Gordo- Pasadena D5, Vannia De La Cuba; ECE Program Officer Avery Seretan; Coordinator of the Office of the Young Child for the City of Pasadena, Crystal O’Grady; Executive Director of Altadena Children’s Center, Toni Boucher; Comprehensive Services Manager at Pacific Clinics Head Start & Early Head Start Nina Paddock. 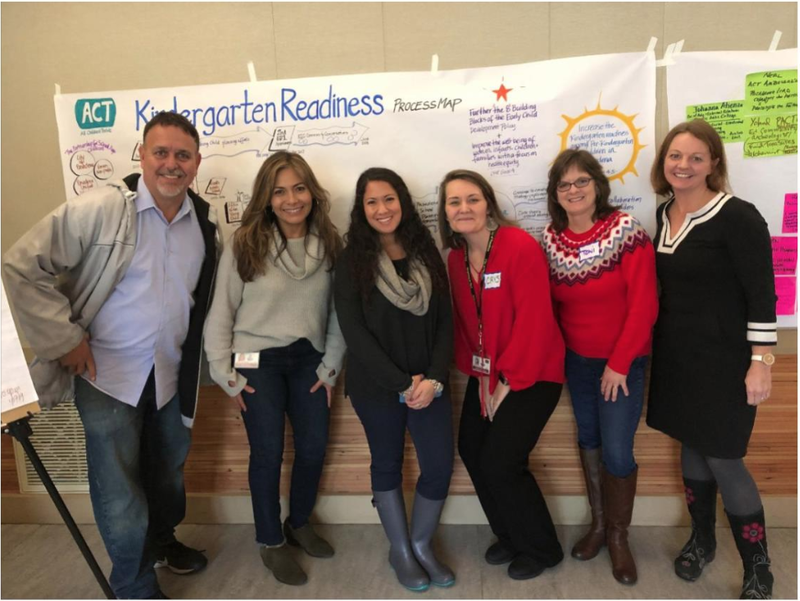 KRA in Pasadena: A group of Pasadena community members, service providers, and city staff gathered on Jan. 17 for a strategic planning session on Kindergarten Readiness for the city. First 5 LA Community Relations Officer Bill Gould, who is actively involved in children's issues for Pasadena, and Early Care and Education Program Officer Avery Seretan who is leading First 5 LA's Kindergarten Readiness Assessment efforts, engaged attendees around the Early Development Instrument (EDI) data. Attendees used the data to help determine strategies and community actions related to school readiness and oral health. Participants also discussed supporting parent caregivers, increasing early quality education, increasing systems integration, and building capacity for collective impact. Pictured L-R: [Top] Vice President of Policy and Strategy Kim Pattillo Brownson introduces speaker Principal Fiscal & Policy Analyst Edgar Cabral from the Legislative Analyst Office. Chamber Intro: One day after the release of his budget proposal, the L.A. Area Chamber of Commerce's Education and Workforce Development Council convened a conversation to explore what Gov. Gavin Newsom's proposed budget will mean for children. 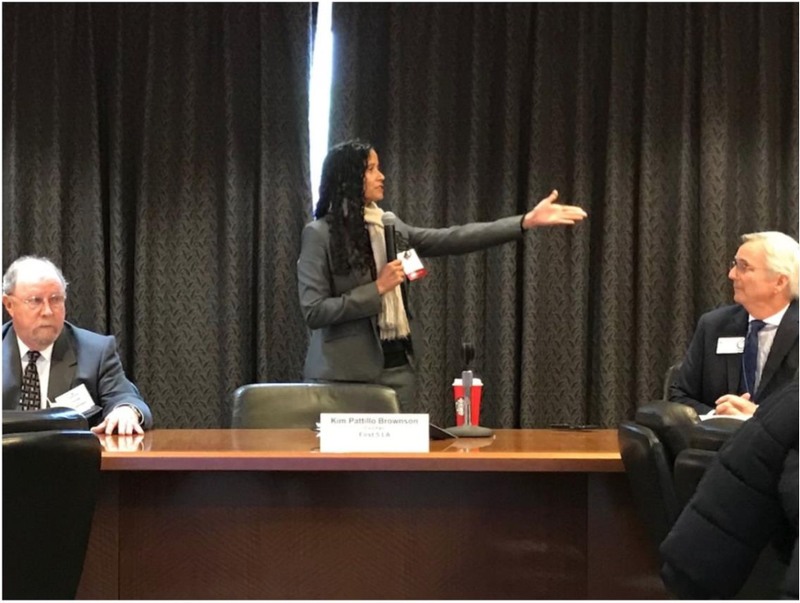 First 5 LA Vice President of Policy and Strategy Kim Pattillo Brownson, who is the committee chair, spoke on the budget, and also welcomed the featured speaker Edgar Cabral, the Fiscal and Policy Analyst for the Legislative Analyst Office. 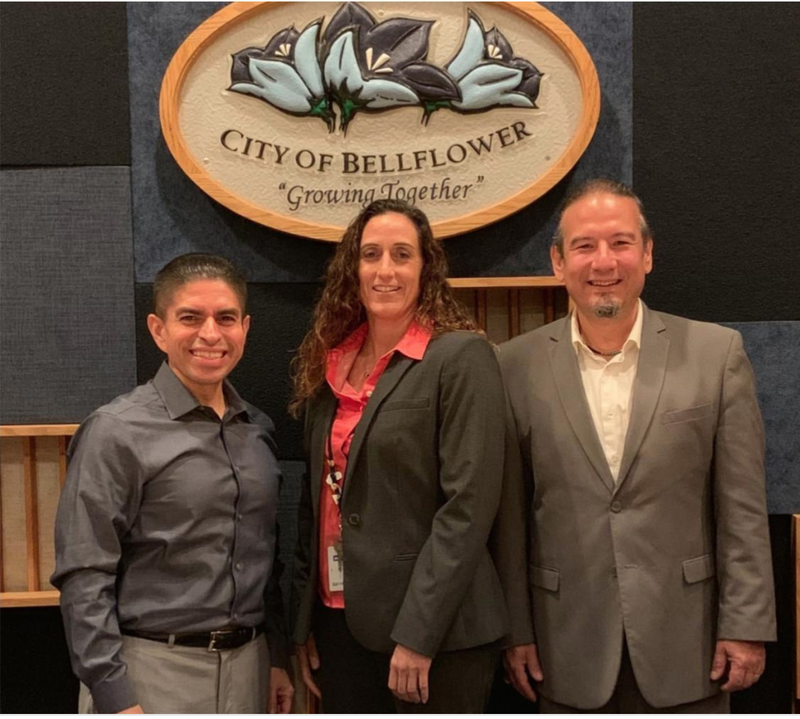 Growing Together: Recently, First 5 LA Community Relations Director Rafael González and Community Relations Manager Leanne Drogin met with Bellflower Pro Tem Mayor Juan Garza to share First 5 LA's goals and priorities and what other cities are doing to support young children. They also discussed the policy work First 5 LA has championed most recently with its investments and advocacy work. Bellflower is home to more than 70,000 residents and more than 30 percent of the city's 0-17-year-old population is under 5 years old. Staff and Pro Tem Mayor Garza agreed to continue the conversation and explore what actions and policies would be most beneficial to support Bellflower's youngest population and their families.